Profile by Vicki Stittleburg: One of our most common backyard birds, the Blue Jay has white underparts, blue upperparts, a blue crest, a black necklace, eye line, and bill, a blue tail with dark bars and a white bar and flecking on its wings. Males and females look alike. You might be surprised to discover that Blue Jay feathers are not actually blue at all; the pigment in their feathers is melanin, which is brown. The blue is a structural color caused by the scattering of light through modified cells on the surface of the feather barbs. Blue Jays have a diverse array of vocalizations. Their calls include jay-jay-jay and queedle queedle queedle-qeedle. They can expertly mimic the call of a Red-shouldered Hawk which can fool even the most experienced bird-watchers. If a Blue Jay spots a predator, it will warn others with a shrill alarm call and may band together with other jays to mob the predator. It seems that no predator, not even the Great Horned Owl, is too formidable for Blue Jays to harass. 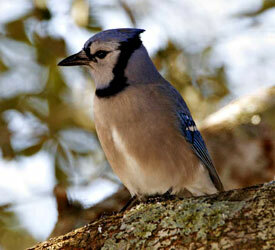 Blue Jays consume a variety of food items: nuts, berries, seeds, insects, and eggs. You can attract this beautiful, vocal bird to your yard by offering seeds, suet or peanuts at feeding stations. They are also particularly fond of bird baths. Blue Jays are one of the backyard's most common birds. They eat a wide variety of foods including insects, nuts, seeds, and grains. They also sometimes take dead or injured small animals. They readily come to seed and suet feeders and are particularly fond of bird baths. Blue Jays usually build their nests in the crotch of trees.